Abstract. Mobile laboratory measurements provide information on the distribution of CH4 emissions from point sources such as oil and gas wells, but uncertainties are poorly constrained or justified. 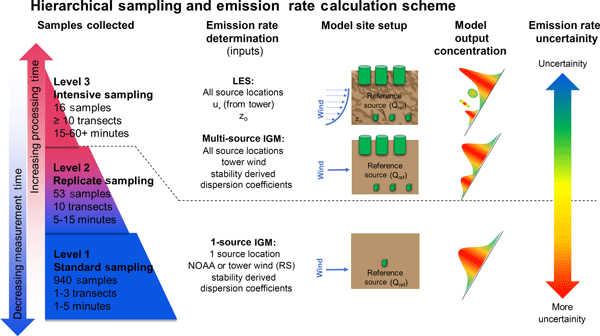 Sources of uncertainty and bias in ground-based Gaussian-derived emissions estimates from a mobile platform were analyzed in a combined field and modeling study. In a field campaign where 1009 natural gas sites in Pennsylvania were sampled, a hierarchical measurement strategy was implemented with increasing complexity. Of these sites, ∼ 93% were sampled with an average of 2 transects in < 5min (standard sampling), ∼ 5% were sampled with an average of 10 transects in < 15min (replicate sampling) and ∼ 2% were sampled with an average of 20 transects in 15–60min. For sites sampled with 20 transects, a tower was simultaneously deployed to measure high-frequency meteorological data (intensive sampling). Five of the intensive sampling sites were modeled using large eddy simulation (LES) to reproduce CH4 concentrations in a turbulent environment. The LES output and LES-derived emission estimates were used to compare with the results of a standard Gaussian approach. The LES and Gaussian-derived emission rates agreed within a factor of 2 in all except one case; the average difference was 25%. A controlled release was also used to investigate sources of bias in either technique. The Gaussian method agreed with the release rate more closely than the LES, underlining the importance of inputs as sources of uncertainty for the LES. The LES was also used as a virtual experiment to determine an optimum number of repeat transects and spacing needed to produce representative statistics. Approximately 10 repeat transects spaced at least 1min apart are required to produce statistics similar to the observed variability over the entire LES simulation period of 30min. Sources of uncertainty from source location, wind speed, background concentration and atmospheric stability were also analyzed. The largest contribution to the total uncertainty was from atmospheric variability; this is caused by insufficient averaging of turbulent variables in the atmosphere (also known as random errors). Atmospheric variability was quantified by repeat measurements at individual sites under relatively constant conditions. Accurate quantification of atmospheric variability provides a reasonable estimate of the lower bound for emission uncertainty. The uncertainty bounds calculated for this work for sites with > 50ppb enhancements were 0.05–6.5q (where q is the emission rate) for single-transect sites and 0.5–2.7q for sites with 10+ transects. More transects allow a mean emission rate to be calculated with better precision. It is recommended that future mobile monitoring schemes quantify atmospheric variability, and attempt to minimize it, under representative conditions to accurately estimate emission uncertainty. 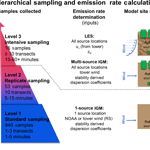 These recommendations are general to mobile-laboratory-derived emissions from other sources that can be treated as point sources. How to cite: Caulton, D. R., Li, Q., Bou-Zeid, E., Fitts, J. P., Golston, L. M., Pan, D., Lu, J., Lane, H. M., Buchholz, B., Guo, X., McSpiritt, J., Wendt, L., and Zondlo, M. A.: Quantifying uncertainties from mobile-laboratory-derived emissions of well pads using inverse Gaussian methods, Atmos. Chem. Phys., 18, 15145-15168, https://doi.org/10.5194/acp-18-15145-2018, 2018. Mobile laboratory measurements have been widely used to quantify methane emissions from point sources such as oil and gas wells, but the emission uncertainties are poorly constrained. We designed a hierarchical measurement strategy to sample natural gas emissions in the Marcellus Shale play based upon high-resolution modeling of select sites. Our study quantifies the largest sources of error with this approach and provides guidance on how to best implement mobile laboratory sampling protocols.